Fourteen people injured in the collapse are being treated at the J J Hospital. The dean of doctors there said two of them are in a critical state. 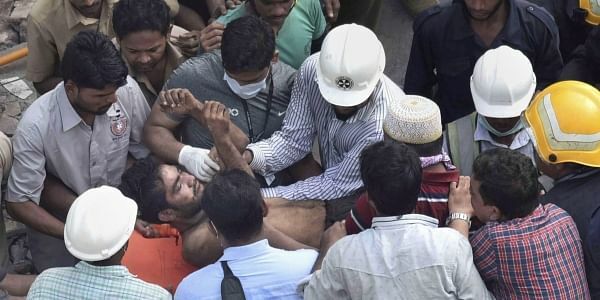 MUMBAI: The rescue effort at the collapse Hussaini Building in Bhendi Bazar, Mumbai was called of this morning, the toll of victims standing at 33 people. Among them was a 20-day-old baby. The 117-year-old building crashed Thursday morning after the city had been battered by 30 cm of rain over two days. "The rescue operation has been called off as it does not seem that anybody else still remains trapped under the debris. However, some fire personnel will remain at the site as a precautionary measure," a senior fire brigade official said. The dead include 23 men, nine women and a 20-day-old male child, police said.The rescue operation went on through the night.